Last week I spent a lot of time thinking about costs. Actually, I spent a lot of time traveling to and from California where my sales manager Charlie Wood and I would host a meeting with a parking design firm. The meeting was to discuss our product Park Sentry, a padding made for protecting columns and cars when the two of them inevitably come together. Arriving at my hotel in San Jose, we entered the parking garage, located under the building. Of course, every single column in that parking garage had been accosted by at least one instance of vehicular column-cide. Each of the dozen or so columns had paint and tire marks where unlucky customers had pulled too close for comfort and left with an unexpected souvenir – and a nice extra bill for their insurance company and deductible. When we introduced our product in 2007, one of our goals was to show the world that column-parking damage could be a thing of the past. It has always surprised me to realize that common sense and dollars and cents do not always go together. We have hundreds of installations of this product in many countries, but it continues to be a small portion of the possible. The adoption of a relatively inexpensive means to eliminate continual large expenditures in body-shop repairs seems like it ought to be a natural. A single bumper repair now costs above $1,000, more than four times the cost of the preventative measure. The fact that the solution continues to work after the fact simply multiplies that equation exponentially. The problem is, of course, the separation of who pays for the prevention and who benefits from it. In the case of my hotel, to install prevention would cost them around $3,000. They currently don’t perceive any benefit to this arrangement, because, after all, they don’t pay for the damages those columns cause. 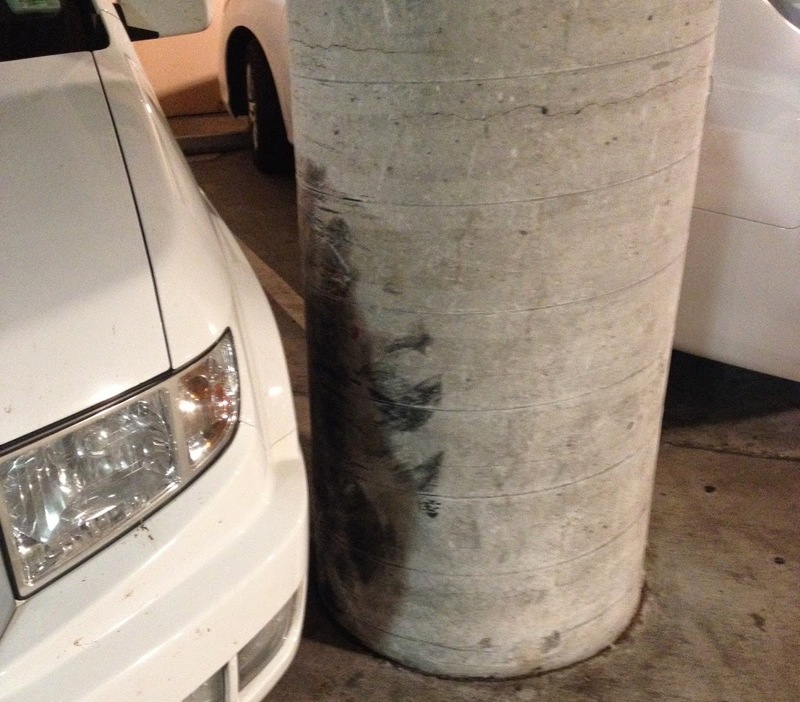 When a person scrapes a column in a parking garage, their immediate reaction is to blame themselves. After all, that column didn’t jump into their path, did it? It didn’t merge into the wrong lane without a turn signal, did it? No, and the embarrassed driver typically skulks away, hoping not to have to pay for any damage done by his car upon the poor, defenseless column. Losing business costs money. And it doesn’t take long for that loss to add up well beyond the cost of prevention. Consider this as well. It’s not just a monetary loss. Disgruntled parkers have Facebook and Twitter as forums to voice their displeasure. And voice it they will. On my way to the airport I asked the shuttle driver about how tight their parking garage is. He said to me, “Oh, you wouldn’t believe how many people tell me how bad this is.” Really! They take the time to tell you that. Interesting. Let’s say, for a moment, that the hotel did drop $3,000 and protected their columns in this parking lot. Beyond the lack of bad publicity this garage will NOT be receiving, perhaps someone who did scrape a column took the time to see that because of what that hotel did to protect his car, his bad driving didn’t cost him a dime. The hotel cared enough about his business that they went beyond the norm and protected him from his own misfortune and this now means he goes home a happy customer. Again, given the age of Facebook and Twitter, how long until he tells his friends how GOOD that hotel was to him, despite his errant driving. How long until a good deed, done in the name of protecting their customer’s property, becomes a point of pride about which the hotel receives praise? Perhaps I’m getting a bit carried away, but you can see where I’m going. In the ultra-competitive business world we live in, specifically the service industry, wouldn’t you want to do everything you can for your customer? Eventually, perhaps your competition will, and then slowly, without knowing it, that competition begins to win your customers away. When is it a good idea for a service type business, such as a hotel, restaurant, office building, or really any business, to think that they should save a few dollars at the expense of their customers, and not eventually feel the consequences of these actions? If something exists to make your customer feel better about the customer experience, that’s a cost worth undertaking.